Why is the ankle easy to strain? The ankle supports the weight of the whole body. The ankle is made up of a relatively small bone and a thick and short ligament. Prone to damage is “sprain”,By weight or from the external shock suddenly applied to the ankle. Hand wash with mild soap in warm water (40°C) and air dry. DO NOT machine wash, iron, tumble dry or use bleach and softeners. Warning Tips: New item may have smell, The smell can be disappeared after you wash it. Package Includes: 1 count Orthopedic Ankle Support Brace by JERN in a sealed polybag. STRONG SUPPORT – Our ankle support fitted with crisscross reinforcement straps to offer strong support & stabilization for the ankle tendons and joints. MINIMIZES INJURY RISKS from strenuous activities, relieves edema and symptoms associated with acute injuries, ideal for sprains, tendinitis and arthritis. 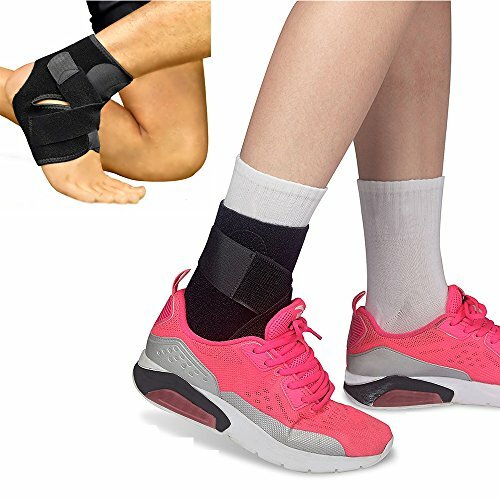 BREATHABLE neoprene compression ankle support brace with moisture-wicking ability which allows oxygen circulation to eliminate odor and prevent bacteria from breeding. GOOD QUALITY NEOPRENE material ensures that it remains flexible, comfortable, washable and strong. ONE SIZE FITS MOST – The adjustable straps allow to meet different requirements and ankle diameters. Ideal for basketball, running, soccer, training and post surgery recovery.